Last year, we brought you the news story about a unique carbon fibre linkage fork from a French brand called Motion. The startup has since launched its project on Kickstarter and has evolved the product considerably since we last saw it. As it currently stands, the Motion fork will be available in 26/27.5/29in sizes, has 110-170mm of travel (depending on model and wheelsize), and comes in at a claimed weight of 1.85kg. Hmm. It doesn’t look like a regular suspension fork, and it don’t look like no Lefty either. So what is it?? So firstly, linkage forks really are nothing new. AMP and Girvin were producing back in the glory days, Whyte used to offer one on the PRST-1, and as you’ll have seen in our Eurobike coverage, German:A is still producing a 1480gm linkage fork in 2016. 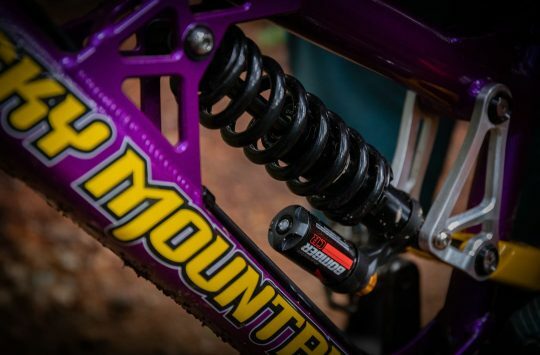 But when most of the big manufacturers choose a telescopic design for their suspension forks, why are smaller companies like Motion using a linkage design? There are a few reasons, but we’ll stick to the ones that Motion refers to with its particular design. Primarily, the multi-link design has been employed to reduce brake dive. That’s the sensation you experience whenever you hit the front brake, and the front suspension ‘dives’ into its travel. With the Motion linkage fork, the company claims that this doesn’t happen. The advantage of avoiding brake dive is that there’s more travel available for when you need it, so we can see the appeal there. But how does the rest of the fork work? Machined alloy linkages and composite bearings control wheel path and travel to deliver the anti-dive functionality. In a design that’s not too far away from what we’ve seen in the Lauf carbon leaf spring fork, the Motion fork also uses carbon fibre blades to create a spring. So rather than having a steel coil spring or an air spring like you’d find in a regular fork, the Motion fork relies on two curved blades to suspend the fork. Each blade is made from unidirectional carbon fibres, which are molded in the curved shape that you see them in here. That means the blades are not being stressed in the fork’s static state. 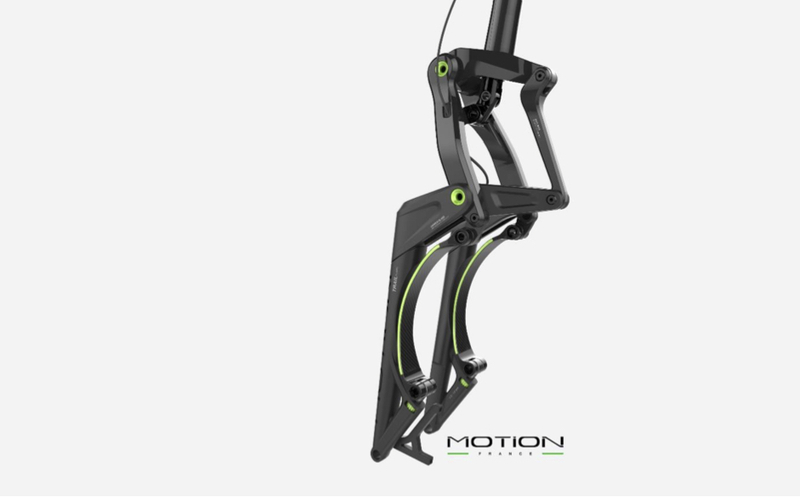 According to Motion France, the carbon blades have been tested with up to 20 tonnes of force under compression without breakage. Purportedly, the blades have also exceeded 2 million cycles of fatigue testing, with no change in performance. As such, Motion offers a Lifetime Warranty on the carbon blades and the rest of the chassis too. 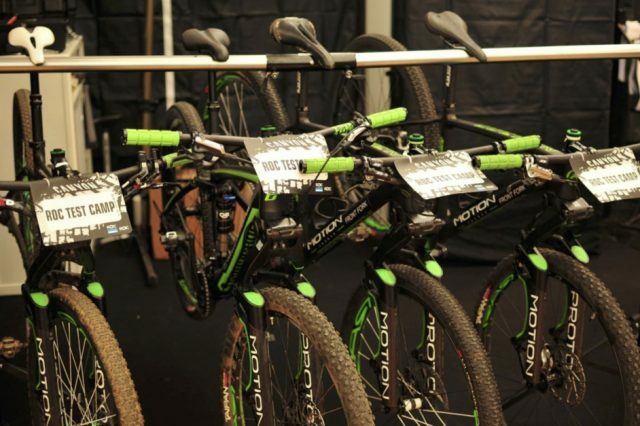 The blades are offered in different sizes and thicknesses, so Motion will offer each fork with the correct blade to match the requested travel amount and rider weight. Want more travel? The blades can be swapped to offer up to 40mm of additional travel. 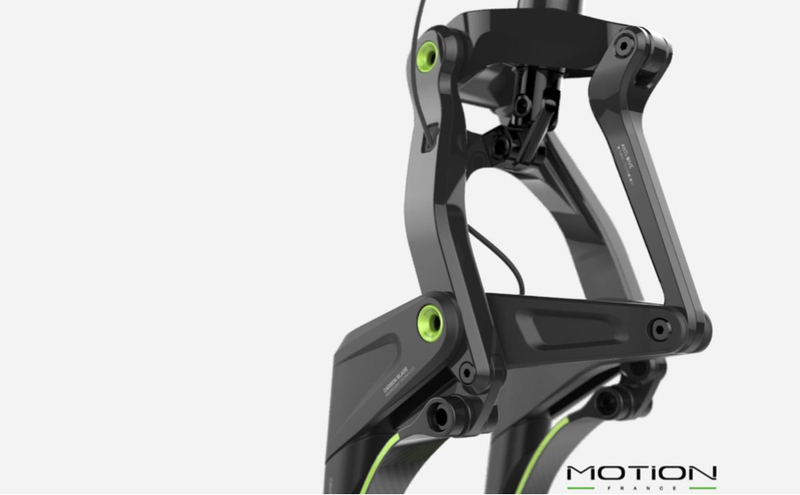 Unlike the Lauf carbon leaf-spring forks, the Motion model does have adjustable hydraulic damping. At the top of the linkage is a small hydraulic damper. It looks like a rear shock, but it doesn’t have an air spring. 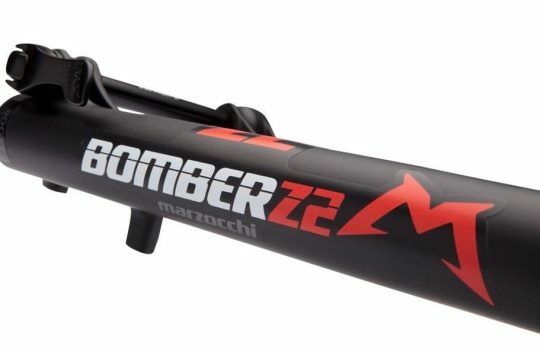 Instead, it’s simply a hydraulic damper that allows you to control rebound speed, and it also has a lockout lever to adjust the fork on the fly. This further distinguishes the Motion fork from the likes of the German:A linkage fork, which uses a small air-sprung shock to control the fork action. With the motion fork, it’s the carbon blades that are the spring for the fork. 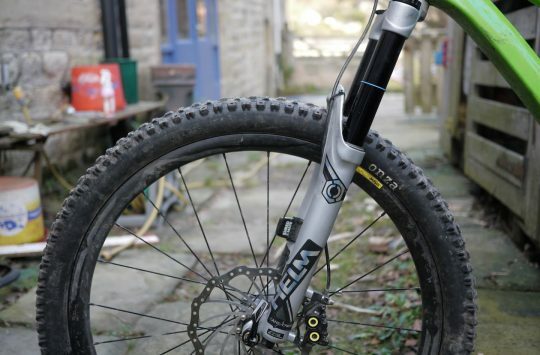 Currently, Motion will be making its linkage fork available to fit 26in, 27.5in and 29in wheel diameters, and the fork will fit up to a 3.0in wide plus-sized tyre. Each fork model has a range of travel that it can work with, so you’ll have 110-150mm (29in), 120-160mm (27.5in) and 130-170mm (26in). 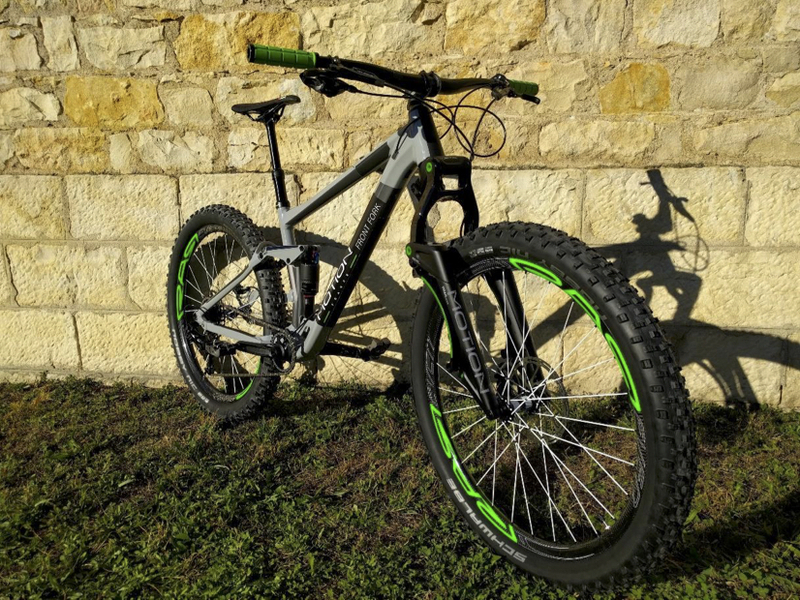 And we don’t know about you, but we would love to see a long travel enduro bike equipped with a 160mm travel Motion fork! The RRP for the Motion fork will be €2500, but as the company is still launching the project on Kickstarter, if you sign up in the next 19 days you’ll be able to get one for half that price. The fork will be entirely manufactured in France, and given its impressive specs on paper and the Lifetime Warranty, it certainly has some appeal.